12th October 2007: Mexican Wrestling Horror Triple! Welcome to a special South of the Border edition of Schlock Treatment. Viewers outside Mexico may never truly comprehend the cult of the masked wrestler. Identities forever hidden behind a full-face mask, their heroes never reveal themselves, and spend their entire public lives with their masks on. They become revered, almost to sainthood, in a deeply Catholic country that sees such grappling matches as an old-fashioned morality play of Good versus Evil. Wrestling made instantly recognizable superheroes of Blue Demon, Neutron, Mil Mascaras (the “Man of a Thousand Masks”) and countless others. It’s no stretch to imagine them being superstars of the silver screen as well, and from the Fifties, enterprising film producers tailored low-budget action films, often mixing them with then-popular genre elements (usually horror or science fiction), for their wrestling heroes (or “luchadores”). And thus the curious hybrid of Mexican wrestling films was born. But it was El Santo “The Saint”, the Man in the Silver Mask, who was the king of Mexican masked wrestlers, and consequently the king of Mexican masked wrestling films. From the late Fifties to the early 80s he starred in over fifty feature films, wrestling Dracula, the Wolfman, Frankenstein and his daughter, spies, karate kicking apes, YOU NAME IT, he knocked it around the ring. Santo In The Wax Museum from 1963 is one of only four Santo films to be translated into English, courtesy of the infamous K. Gordon Murray. Murray purchased scores of Mexican wrestling, horror, science fiction and even kiddie films (remember Santa Claus vs Satan, anyone?) and dubbed them in his Florida voice factory, repackaged them and sold them off to B-programs and late night TV. Somewhere between Mexico and Florida, Santo has become “Samson The Silver Masked Man”, but he’s still the crime-fighting champion of justice complete with secret laboratory, as well as the king of the ring, a fact hammered home by three lengthy and somewhat gratuitous wrestling bouts. However, Mexican wrestling films are pure genre, and like wrestling, genres have strict rules. Santo good, villains bad. The action unfolds as the pretty Susan, a magazine photographer, tours the wax museum of the mysterious Dr Karol. Upstairs are figures of the great villains of the Twentieth Century – Stalin, Gandhi, Garry Cooper – while in the dungeon is the Chamber of Horrors: Frankenstein, the Wolfman, the Phantom of the Opera… It turns out Dr Karol is a former inmate of Dachau, and as expected, a concentration camp does strange things to a man’s brain. Obsessed with turning beauty into ugliness, he kidnaps Susan and plans to transform her into a living-dead wax model of a Panther Woman (now that’s hot), so that the dark side of the human soul is immortalized in wax forever. Santo joins the tag team of Susan’s sister Gloria and her fiancée Charles as they wrestle an army of mutated and animated wax monsters. It’s part House Of Wax, part Island of Dr Moreau, all Mexican movie madness and features an entertaining protagonist who tears open his shirt with hideously scarred hands while endlessly philosophizing about man’s inhumanity. He seems to forget about the absurdity of existence – a point illustrated perfectly by having a shirtless masked wrestler driving around and waving happily from his sportscar. 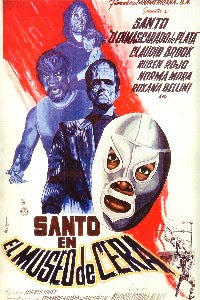 One day the Vatican will recognize the true saintliness of El Santo, but until then there’s always his movies. And this is the first in our series of Mexican masked wrestlers – the 1963 Santo In The Wax Museum. Wrestling Women vs The Aztec Ape was the first in a series of six Wrestling Women or “Las Luchadoras” films, an attempt to feminize the almost entirely masculine world of masked wrestling movies. The first three team Mexican genre icon Lorena Velasquez with American cupcake Elizabeth Campbell, and two were successful enough to get the K. Gordon Murray treatment. Thus Las Luchadoras Contra el Medico Asesino becomes “Doctor Of Doom”, and later in the 80s gets a bogus surf soundtrack and is redubbed “Rock And Roll Wrestling Women vs The Aztec Ape”. Lorena Velasquez is Gloria Venus, a gorgeous almond-eyed wrestling dynamo who gets thrown around the ring then leaves it without a hair from her Elizabeth Taylor do out of place. She’s teamed up with new partner The Golden Rubi, a red-haired firebrand from North of the Border, and from the moment they meet they become the best of friends. But not that good, if you know what I mean. Wrestling Women… opens with a series of murders attributed to a killer branded the Mad Doctor, who leaves his female victims completely brainless. The Doctor, who spends most of the film with his head in a pillowcase with eyeholes, is intent on perfecting brain transplants, and has even grafted a gorilla’s brain into a man’s body. The resulting monobrowed monster known as Gomar, a goofy-looking creature with arms covered in carpet fluff, is sent out to grab more women, and one happens to be wrestler Gloria Venus’ sister Alice Fontaine (or Alicia Flores). As she dies on the table, the Mad Doctor decides he needs a more resilient female subject - physically strong, as well as intelligent, and with a profession. It’s no stretch of the imagination who he picks – Lorena Velasquez, I’m looking at you! Aided by the Golden Rubi, the inspector and his dimunitive assistant as well Alice’s kindly boss Professor Wright (who’s dubbed to sound like James Mason), Gloria sets out to seek revenge. After a few false endings the Doctor manages to escape the gauntlet, and successfully transplants the Ape’s killer brain into the body of a female wrestler (complete with cries of “She’s alive! She’s alive!”). Adding a mask, she becomes “Vendetta”, and the Mad Doctor, also in a ghoulish mask posing as her masked manager, challenges Gloria to a death match. The plan is to legally murder her in the ring, and so Gloria now needs to fight for her life! 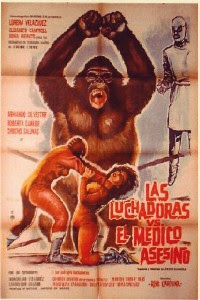 Aztec Ape is directed by masked wrestling specialist Rene Cardona Sr, who masterminded all six Wrestling Women films, and also directed Lorena Velasquez in Santo vs The Zombies and Santo vs The Vampire Women. Lorena was one of the few wrestling movie icons to NOT be a professional wrestler, and subsequently needed a body double for many of her ring sequences. And you can tell she’s not a real wrestler - she’s certainly more “leggy” than the other girls at the Wrestling Academy. 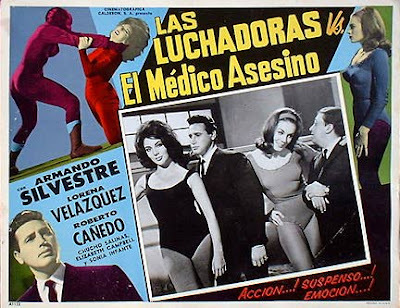 Soon on Schlock Treatment is the follow-up from 1964, Wrestling Women vs The Aztec Mummy, but for now we’re thrown kicking and screaming into the pit with Las Luchadoras in Wrestling Women vs The Aztec Ape. Welcome to the third of tonight’s Mexican masked wrestling horror flicks, and this one’s an early example of the luchadore genre. 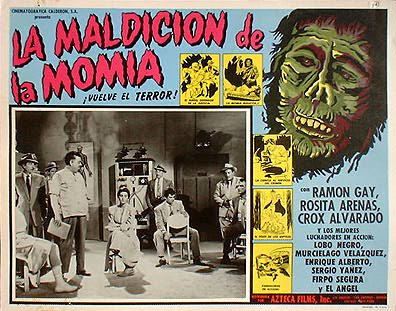 Curse Of The Aztec Mummy is the second of a three-film series filmed back-to-back by cheapskate production company Calderon in 1957. Exploiting the Aztec Mummy angle is a cost-effective attempt at creating a homegrown monster, and it’s certainly a unique reimagining of the classic Egyptian model – tatty coat, Keith Richards hair, and the oddest dubbing job by K. Gordon Murray that makes it sound like a hungry wino. Or, for that matter, Keith Richards on a North American tour. 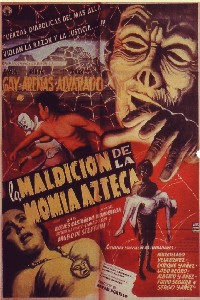 Curse… begins where the first Aztec Mummy finishes: the eeeeevil Dr Krupp (also known as “The Bat”) is busted out of police custody by his evil henchmen, and plans to kidnap the good Dr Almada and his fiancée Flora. In a lengthy flashback, Krupp relates the first film’s integral plot point in which a hypnotized Flora, an Aztec princess in a previous life, relates the whereabouts of the Aztec treasure. She was put to death, while her treacherous lover, an Aztec warrior named Popoca, was cursed to eternal life while being buried alive. Almada wants Flora to prove his theories on reincarnation; Krupp, with his eeeeevil beergut and Van Dyke beard, just wants the cash. …But of course it’s not the final word from the eeeeevil Dr Krupp. Virtually the entire cast and crew return to do it all again in the third film Robot vs The Aztec Mummy, released in mid-1958. All three black and white movies clock in at just over an hour, and with their episodic, heavy padding, quasi-cliffhanger structure and stagy melodrama filled with cardboard cutout gangsters and mad scientists, are reminiscent of the old American serials of the 30s and 40s. What you didn’t see north of the border is a masked wrestler driving up to a crime scene in a sports car. And therein lies their charm. We hope you enjoy the beans and cheese of Curse Of The Aztec Mummy.